The Essence of Home: They Can Stop Growing Now! Remember when I was showing you pics of my newly planted paper white bulbs? I was enjoying seeing how they were getting taller little by little every day. In fact, I recall wondering if I could grow these things at all! Well, I'm here to tell ya, I have NO problem growing paper whites. In fact, I have the documentation to prove it. I honestly wish they would quit growing now, too, because they are getting a little bit out of control. Notice all of the string I've used to tie it up? It's gone way past just tying a cute little bow around the stems. I'm now having to anchor it down to what it's sitting in so it doesn't topple over! They were leaning over one morning, very dejected looking too, so I had to rig some string on this one too. See that fancy get-up? The back of the chair came in handy. So, what I've learned about planting paper whites is that they are easy and pretty when they're small to medium size. But when they get mature and tall, they get unruly. Then you sort of have to babysit them. I wish I had used that Vodka trick that I've heard so much about. Just didn't want to spend the money on it for flowers! If anyone knows from past experience about these flowers, please tell me that they eventually do quit growing. Otherwise, I'm going to have to go get some rope! I love growing paper whites....they are so much fun to watch! I swear they seem to grow right before your eyes. I have heard you can add a little rubbing alcohol to the water to keep them from growing so tall but I have never tried it. I always add a piece of willow in the middle of my containers to help them stand up straight along wit a little twine...it seems to do the trick. This year I bought paper whites that don't grow as tall but they haven't bloomed yet since I planted them a little late. Love the containers you chose for yours, very pretty! Wow-those did get really tall!! They look pretty, though. I need to try those-I usually kill all plants-ha! You have the magic touch. They love growing for you. I had heard too that if you put the rubbing alcohol that will keep them from getting too tall too. I have never tried this. They look really pretty. lol the same thing happens to mine every year. That's why I don't fool with them plus hubby hates the smell. They are beautiful! I've never grown them, but a couple of years ago a friend gave me some already in bloom and I just loved them. They smelled so good and are so pretty. It looks like you may soon have a paperwhite Tree. lol. I think they are wonderful. I have a small clump that was planted outside and I look forward to seeing them each year. Oh my, they are thriving. You have the touch. yep, they're known for that. The trick is to get them established with just water, then switch to the alcohol infused water. I think it's an 8/1 ratio. It does slow them down but it's tricky. Mine are the stage now to start dosing them. they can get away from you quickly. but they're so pretty, even trussed up, LOL! I'd put a closed circuit camera on them, Kelly - you don't want to wake up in the middle of the night to find that they've taken over the house! Fun hearing all the comments about these paper whites! I never heard about the alcohol. I am not a fan of the smell of them, but they are really pretty. I wish I could grow them here in South Texas. What do they smell like? everyone is saying how they don't like the smell. They are gorgeous! So funny though also. I know this isn't funny, but I can't stop laughing, as I was thinking soon it will be Jack in the Beanstalk, and it will be climbing out your window and up a tree to the sky. I've never tried them in the house, but there are some planted on the side of my yard that come up each year and my hubby doesn't like the smell either. HaHa..thanks for giving me my chuckle for the day. Rope...that's funny. I used to put one of those, open on both ends, glass globes over them and they would grow up through it and it would keep them straight..You know, like the tall glass you might put over a candle ?? Well, these are one of the things I have not had personal experience with. Now this may sound completely off the wall. But what would happen if you gave them a little haircut? I guess they would no longer bloom, huh? Well, they sure did look pretty when they were starting out. Now they look like...well, I'm not sure what they look like. Reminds me of the crazed passion vine that climbed my tree. I grow amaryllis and sometimes I have to stake them. But I always then plant them in the ground so why don't you plant these on your property. They will come up and bloom not this spring but next. Do not cut the green foliage. Remember Jack and the Beanstalk? hehe Maybe you need to quit feeding them to stunt their growth! I've never planted them, so I'm taking notes from you gals that have. As with any plant, they are stretching for light. You need a very bright cool location to keep them shorter or some growth retardant spray that greenhouse growers use, which I do not recommend. Enjoy them while they last and don't fret if you have to remove them when they become unruly. I have had no luck with them in my home. Yours look pretty nice actually. They still look pretty even with their string around the middle. I had to do the same thing to mine. As another reader said, lighting and temperature are what effects their growth.If you try growing them again put them in a bright but not sunlit location. 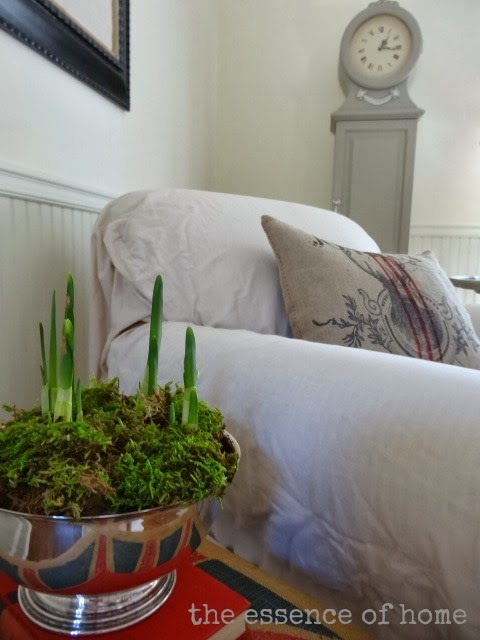 Paperwhites do have a very strong sweet smell which a lot of people find unpleasing. Hi Kelly, welcome to the plant world - sometimes it seems like if you want them to grow they grow too much, lol. Happy Holidays! 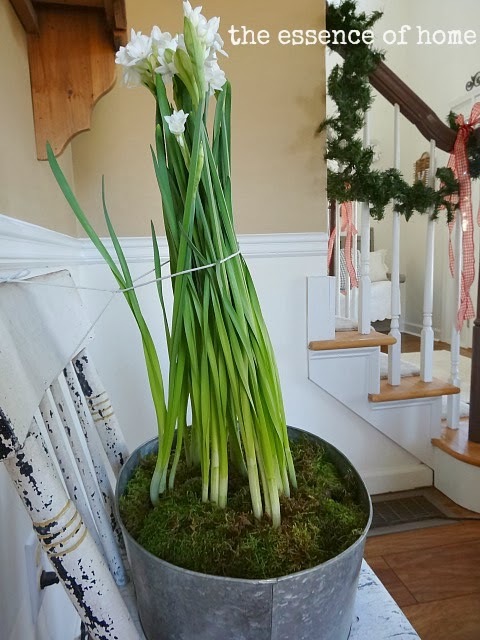 Wow Kelly, you have paperwhites on steroids, LOL. I have always wanted to try them but haven't had a chance yet. 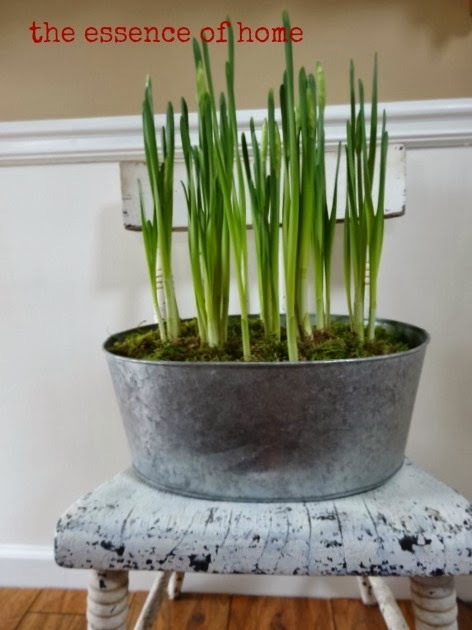 Yvonne at Stonegable has such a good idea for paperwhites - she paints a tree branch and plants it in the middle of the bulbs to support them when they are grown. I think she posted it on her blog earlier this month. I have paper whites planted in my front planter. They grow too big and fall over. Whoa! Mine are too next year I am going to add alcohol to keep them from growing so tall.You have to do this when you plant the bulbs in the stone. I didn't grow mine, but bought them at the supermarket. They've gone crazy, and today, we found them on the floor, toppled over. I've had to tie mine, and stake them, too. I have to say that I do not like the way they smell. I thought we had an electrical fire the other day, but it was the paper whites! They are beautiful…love the containers you used and where you placed them…they are obviously very happy! !